In 1896, Richard F. Outcault, or, as he was known professionally, R.F. Outcault, found himself—from humble origins in Lancaster, Ohio—to be at the top of the New York journalism world. Commanding a huge sum of money, Outcault jumped ship that year from Joseph Pultizer’s New York World to William Randolph Hearst’s New York Journal, taking his work with him. But Outcault wasn’t a writer or editor or photographer—he drew comics, the first such artist to become a bona fide superstar. It was Outcault, in fact, who invented the dialogue balloons seen in most every comic book since, and it was Outcault’s most famous creation, the Yellow Kid, a sardonic Irish ragamuffin who lived on the streets of New York City, that gave us one of journalism’s most enduring insults—so-called yellow journalism, or what we might call clickbait today. According to a poll released this week, Americans distrust the media more than we have since 1972, when Gallup started asking. But distrust of the media—and not just presumed bias—isn’t really anything new. That’s because since their 19th-century beginnings, tabloids have been, mostly, a vessel for diversion and entertainment—you could leave the serious business to the broadsheets. The World and the Journal (like modern equivalents such as the New York Post and the Daily Mail) were for too-good-to-check tales of everyday heroism, strident crusades, and, of course, pictures. Lots and lots of pictures. Were the stories true? Who knows. It was fun to read, though. For decades, the tabloids were also, thanks to Outcault, for comics. And it was his comic that would begin the craze. 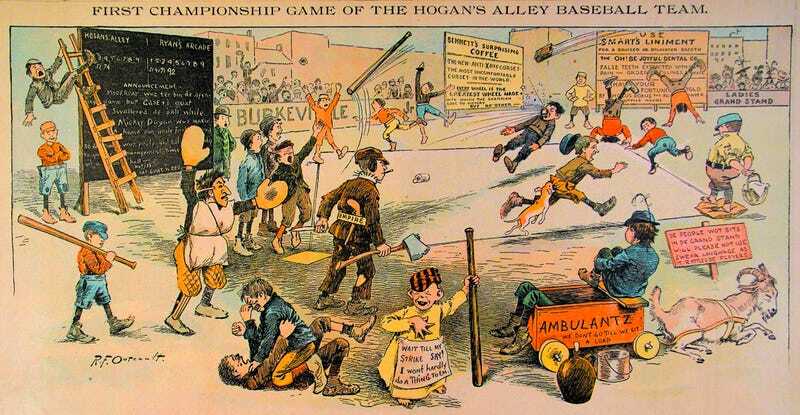 Titled Hogan’s Alley—a fictional New York City slum—the comic, depending on the day, could be funny, brutal, melancholic, racist, and acerbic, sometimes all in one. It first appeared in Truth, a magazine, in 1894, and then Pulitzer’s World early the next year, and proceeded to take New York by storm. Outcault’s comics were richly drawn tableaus of life in the slums, popular in part because you didn’t need to read the words—New York’s population then was 40 percent foreign-born— to understand what was going on. They were vulgar, violent, and sometimes explicitly xenophobic, their appeal something like that of reality television, in which readers could be an audience to the rabble, yet still a layer removed.